A friend gave me a loaf of bread from a bread machine. I don’t mind bread from a machine but they just don’t seem to have the same texture as regular kneaded bread. However, this loaf was oversized which made it perfect for Mountain Toast on the Weber Genesis Grill. I cut two slices of the bread about 3/4 inch thick. Each of these slices would be about the same as two slices on a regular loaf. I mixed 50 ml (1/4 cup) of soft margerine, 25 ml (2 tablespoons) of mayonnaise, 1 clove of minced garlic, and 5 ml (1 teaspoon) Worcestershire sauce in a bowl. I spread it on both sides of the bread slices. I preheated my grill to very hot and put the bread on the grill. It only took a little over a minute to get some good grill marks and I flipped the bread. When I had grill marks on the other side, I turned the bread 90 degrees and flipped again. I cooked until I had good cross hatched grill marks and turned one last time to cross hatch the other side. 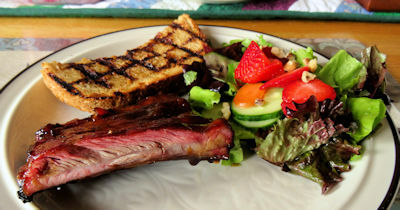 We served it with Maple Glazed Ribs and a nice salad. I love this. A nice crisp outside with a soft centre. There is a good garlic taste and the Worcestershire gives it some spice. Easy and tasty! Mix the margarine, mayonnaise, garlic and Worcestershire sauce. Spread on both sides of the bread. Get barbecue grill very hot. Put slices on grill and flip when well marked by grill. When well marked on the other side, turn 90 degrees and flip. Grill to get a crosshatch pattern. Flip and grill for a crosshatch pattern on the other side. What a great idea for fresh homemade bread, I’ll be sure to give this a try!! Thanks, Sam! It does make for an easy side. 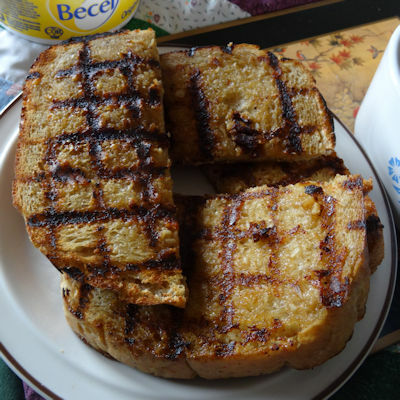 These toasts really do sound good. I’ve never heard of mountain toast before. I love the mayo in the mix. Thanks for the recipe! I made the name up so I’m not surprised you haven’t hear it before.